Exergen Temporal Artery Thermometer is a totally non-invasive system with advanced infrared technology providing maximum ease of use with quick, consistently accurate measurements. Advanced, patented technology measures temperatures with a gentle stroke across the forehead. 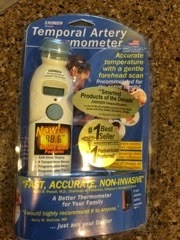 I always have problems with thermometers when it come to getting an accurate reading, but not with this product! My daughter came down with a little bug so I got to test this thermometer out a little earlier than anticipated. 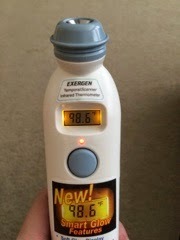 As you can see above she had a slight fever but I was so relieved when I scanned my own forehead and got an accurate reading and a completely normal temperature of 98.6 degrees. I love how easy it was to use and that there's no fighting with a sick child to try to keep the thermometer under their armpit or tongue. I highly recommend this product to anyone with kids and even those without. No more taking the kids temperature multiple times only to still wonder if its accurate. I can scan their forehead at night without waking them up when I'm worried about their temperature getting too high during the night when they are ill. 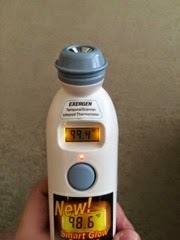 This thermometer has given me accurate readings ever time and I only wish I'd discovered it sooner!